The EU explained: New "Parlamentarium"
“Parlamentarium”, the new European Parliament visitors centre, will open next Friday 14 October. This new initiative aims at raising citizens’ awareness on European policy and policy-making in a fun and interactive way, combining information, education and entertainment. Visitors will have the opportunity to understand how EU decisions are made and how they influence their daily lives. 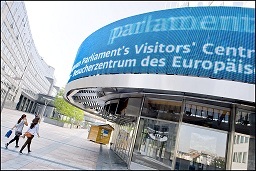 Designed for all, this is the largest parliamentary centre of Europe and the first to be accessible in 23 languages. European policy can be quite difficult to understand; the exhibition will therefore be particularly interactive and attractive. The centre will propose many activities : a 360° picture of the hemicycle (providing an overview of the decision-making process of the European Parliament and of decision-makers), a virtual trip across Europe (explaining what the EU has done for each Member State and discovering that all Member States are different but share a common policy), a role play for schools, videos messages from MEPs and citizens across Europe, a multimedia tour and a trip through time (150 powerful images and many historical documents). “Parlamentarium” should welcome up to 450 000 visitors a year and will be opened every day. Its entrance is free.